08, Dec 2017 Colombo, Sri Lanka – World Soil Day is held annually in December as a means to focus attention on the importance of healthy soil and advocating for the sustainable management of soil resources. In Sri Lanka, the Food and Agriculture Organization of the United Nations (FAO) observed World Soil Day in the central highlands, where FAO with funding from the Global Environmental Facility (GEF) is providing policy and institutional support to the government for the rehabilitation of degraded agricultural land. Establishment of demonstration sites and innovative funds for sustainable land management are also important components of FAO’s work in the central highlands. 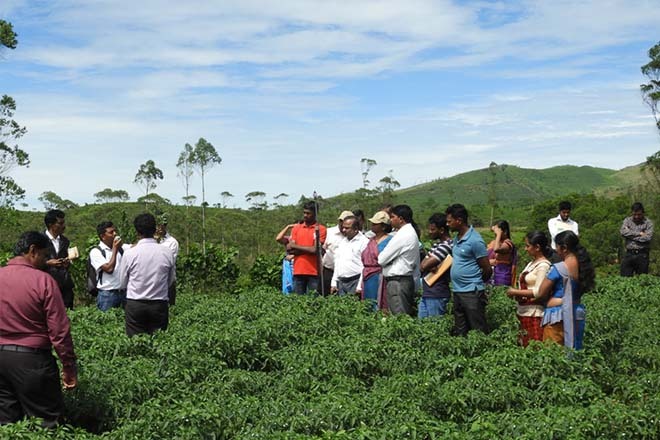 FAO is working with the Ministry of Mahaweli Development and Environment and in close consultation with the Natural Resources Management Center (NRMC) of the Department of Agriculture to rehabilitate degraded agricultural land in the Badulla, NuwaraEliya and Kandy districts. Land degradation due to soil erosion and decline in soil fertility particularly on agricultural land is a major issue in the central highlands of Sri Lanka with 50% of agricultural lands in a degraded condition. To mark World Soil Day, FAO in partnership with the NRMCand the Provincial Department of Agriculture, Central Province conducted a field day on soil and water management for agriculture officers and farmers in Ruwanpura in the NuwaraEliya district. The field day focused on creating awareness on the watershed approach to soil and water conservation, and identifying gaps in sustainable land management in the district. Director of the NRMC Dr. S.H.S.A. de Silva outlined the importance of arresting soil degradation which could reduce the productivity of crops due to the removal of the top soil. “It is encouraging that farmers have begun to realize the importance of soil fertility. The farmers have witnessed the benefits of soil management practices and are now convinced.” he stated. Understanding that conservation of natural resources is best ensured when local communities are actively involved in their management, FAO will inaugurate Research and Demonstration sites on a 1.2 hectare plot of land located at the Soil Conservation Training Center of the NRMC in Kundasale in the Kandy district. This will enable government officers, farmers, and students to gain insight on practical application of on-farm and off-farm soil and water conservation measures while facilitating research; all in a bid to minimize the degradation of soil resources and ensure soil preservation. “Caring for the planet starts from the ground,” the central theme of World Soil Day 2017 resonates how soil, like air and water, is critical to life on earth. Caring for the planet and its environment means caring for its soils. Soils are incredibly resilient, but they are also fragile and can be easily damaged or lost. Therefore, the sustainable management of soils is required to support food production, sequester more carbon, store and supply more clean water, maintain biodiversity, and increase environmental resilience to a changing climate. In a concrete contribution towards Sustainable Development Goal 15 – Life on Earth, more than 100 member countries shared their national carbon maps which FAO put together into a comprehensive global map to date showing the amount of carbon stocks in the soil. The Global Soil Organic Carbon Map, illustrating the amount of soil organic carbon stock in the first 30 cm of soil, reveals natural areas with high carbon storage that requires its conservation, as well as those regions where there is the possibility for further sequestration. This information can prove a powerful tool to guide decision-making on practices that aim to preserve and increase the current soil carbon stocks, helping win the fight against climate change.